Last night Stuart and I went to see Hay Fever at The Duke Of York's Theatre in London's glitzy West End. 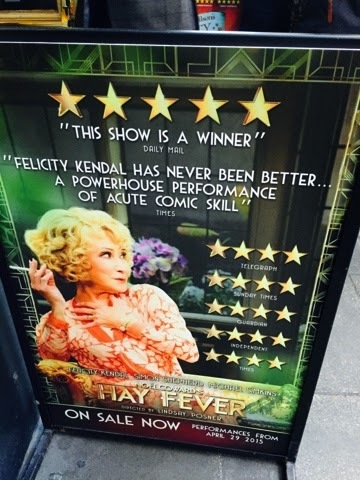 Starring national treasure Felicity Kendal and directed by Lindsay Posner this was the Theatre Royal Bath production of Noel Coward's classic comedy. It was all very amusing. And at times quite funny. Coward can be very drôle, m'dears. Pompous but drôle. Felicity Kendal was great playing the mother Judith Bliss – a once glittering star of the London stage - alongside her dysfunctional scene-stealing family. Her author husband David Bliss (played by the lovely Simon Shepherd) and the dreadful Bliss children unbeknownst to each other have each invited someone down to stay for the weekend in their Berkshire rural retreat. And they are a competitive bunch. All is not Bliss in this particular respectable English family as they soon show their true colours and try to outshine and out-misbehave and out-seduce one another. The unassuming visitors are subjected to unconventional, risqué and often downright rudeness. Outrage, mock outrage, drama and melodrama proliferate. Can they stand it? You'll have to come along and find out. It's all funny enough - if you find posh people squabbling and ignoring houseguests funny - which luckily I do! Ms Kendal is in fine form and her performance is reason enough for our trip.